Paul (pictured) and his younger brother Adam resisted with all their strength when several armed men from the Boko Haram sect burst into their house in their village, located in Borno State, and dragged them outside. "They ended up lifting us up and threw us in a car. They handcuffed us, and we remained like that for a day," remembers Paul from the Minawao camp, in Cameroon's Far North region, where he is now a refugee with his brother and mother. "Our abduction happened almost three years ago but it feels as if it happened yesterday," he added. With the two boys handcuffed on the back seat, the car drove towards the Sambisa forest, one of Boko Haram's strongholds bordering Cameroon. The abductors quickly asked the family for a ransom of 20 million nairas (or US$100,000) for the release of Adam and Paul, then 12 and 14, or they would be killed. In the forest, the brothers, who are Christians, were forced to convert to Islam. Paul remembers that his kidnappers kept screaming: "We will cut your throat if you don't convert." On the second day of their captivity, the boys were forced to stand against a mud wall. Boko Haram militants trained their Kalashnikovs on their backs and threatened again to kill them. "Then they dragged us to a well and I thought they would throw us in, but they just wanted to scare us …They finally brought us back under the tree where we had been sleeping the past night," Paul recalls. With no blankets to keep warm at night, little food to eat for several days and the constant threats of execution, the two boys kept thinking they would die. "We were often crying. We were cold. We were thinking how much we missed home and our mother," Paul said. The two boys were told they would be trained to become fighters – a fate that they would in fact escape. Unknown to them, negotiations were underway between the boys' uncle and one of the leaders of Boko Haram in Borno State, and they were finally released after seven terrifying days. 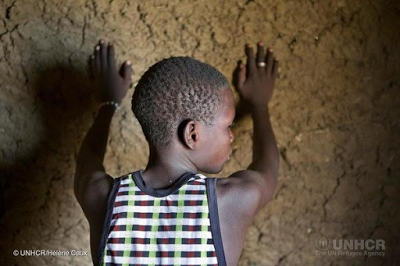 Hundreds and possibly thousands of children have been abducted in Nigeria since 2013, when Boko Haram stepped up their insurgency. The spectacular kidnapping of 276 girls in Chibok, in Borno State, on April 14 two years ago made headlines all over the world and generated unprecedented social media engagement (see #BringBackOurGirls). Some 50 of the girls managed to escape in the following hours and days of the brutal kidnapping, although the fate of the others remains unknown. Abductions of girls and boys had been happening long before that high-profile incident and still occur on a regular basis. Schools and dormitories have been raided regularly in north-eastern Nigeria by armed men. Boys are kidnapped for recruitment into the sect's ranks while abducted girls will be exposed to forced marriage, sexual exploitation and abuse. Some families have escaped to neighbouring countries for more safety and as a preventive measure, although kidnappings of children have also been reported in Cameroon, Chad and Niger. In the past year, girls have also been used more and more to carry out suicide bombing attacks. "Being kidnapped or being a victim of violence are life-threatening events that trigger huge anxiety and distress. It will impact enormously on the emotional world of any child," says Caroline Schmidt, UNHCR Regional Education Officer for West Africa and the Nigeria situation, based in Dakar. In refugee camps in West and Central Africa, UNHCR, the UN Refugee Agency, and its partners have implemented activities that support boys and girls who have experienced violence or abuse, and have suffered during their flight or have been separated from their families. They receive special assistance, including psycho-social support and access to child-friendly spaces. UNHCR also trains and supports teachers to ensure that schools are safe and protective spaces where they can regain a sense of normalcy. It is hoped that a safe environment such as the ones provided through schools in refugee camps and host communities will enable children and youths to have a positive outlook on the future. "We are refugees now in Cameroon, and we feel safer. I miss my home in Nigeria, my village and my friends," Paul said, noting the ongoing insecurity in his homeland. "But I am still afraid of going back there and possibly meet with the men who abducted me."